Hong Kong is to investigate possible Libor rigging by UBS, a day after the Swiss bank agreed to pay £940m to regulators for trying to manipulate the key rate on an “epic scale” and two former traders at the bank were charged with conspiracy. The Hong Kong Monetary Authority, the city’s de facto central bank, said it has received information from overseas regulators about “possible misconduct” by UBS involving submissions for the city’s interbank rate, known as Hibor, and other reference rates in Asia. UBS was fined by Swiss, British and US regulators on Wednesday after an investigation revealed evidence of massive misconduct in the setting of the London interbank offered rate (Libor), a global reference that affects trillions of dollars of loans and mortgages. The penalty is the second-largest banking fine ever. The Hong Kong Monetary Authority said it had “commenced an investigation to assess whether the potential misconduct had any material impact on Hibor, which is considered a key benchmark interest rate for economies in the region. It will work with overseas regulators to gather information and “consider further actions that need to be taken” pending the findings of the investigation. Tom Alexander William Hayes, 33-year-old British former Tokyo-based trader, and Roger Darin, a Switzerland-based managing director responsible for the bank’s Libor submissions, were both charged with conspiracy, the US Justice Department said. They are the first to face criminal charges in the investigation into Libor manipulation by global regulators. Mr Hayes was also charged with wire fraud and a “price-fixing violation arising from his collusive activity with another bank to manipulate Libor”. He was one of three men arrested last week by the Serious Fraud Office in connection with its own investigation into Libor-rigging. Mr Hayes, was described by the US investigators as one of UBS’s most successful yen derivatives traders and was said to have generated profits for the bank in the three years before he left in September 2009 of $236m. The size of his profits meant the banker could have earned anything up to $20m over the period based on the way banks pay their top traders. UBS’s fine is more than three times the £290m fine levied on Barclays in June for attempting to rig the Libor benchmark rate used to price financial contracts around the world. It includes a £160m payment to the Financial Services Authority, the largest penalty ever levied by the British watchdog, $1.2bn paid to US authorities and a 59m Swiss franc ‘disgorgement of profits’ order from the Swiss. 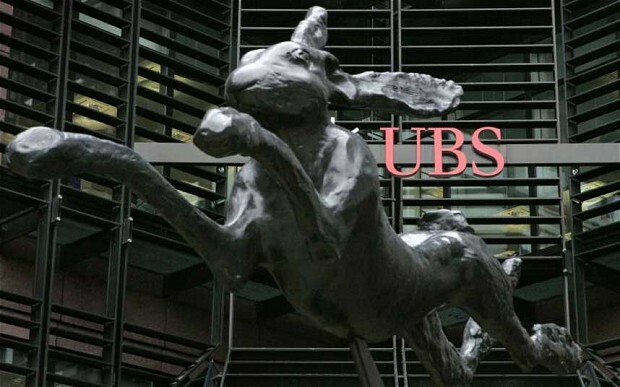 As part of the settlement, UBS’ Japanese arm has agreed to enter a plea to one count of wire fraud relating to the manipulation of certain benchmark interest rates, including yen Libor. The steep fine for UBS is despite the bank, since 2011, co-operating with law-enforcement agencies in their probes. The bank said it received conditional immunity from some regulators. In a statement on Wednesday, UBS said that certain personnel had “engaged in efforts to manipulate submissions for certain benchmark rates to benefit trading positions”. “Certain employees at the bank colluded with employees at other banks and cash brokers to influence certain benchmark rates to benefit their trading positions,” UBS added. The bank said that this conduct related to seven benchmark interest rates, although the nature and extent of the behaviour in question varied significantly from one currency to another. “We have co-operated fully with the authorities and taken decisive and appropriate actions to correct the issues and to strengthen our control processes and procedures,” he added. The FSA said at least 45 people were involved in or were aware of the rigging and that the breaches occurred over a five-year period between January 2005 and December 2010. The watchdog described the misconduct as “extensive and widespread”, with at least 2,000 requests for inappropriate submissions documented and “unquantifiable” number of oral requests. In its final notice to UBS, the FSA details some of the interactions, saying that “in the course of one campaign of manipulation”, a UBS trader agreed with his counterpart that he would attempt to manipulate UBS’ submissions in “small drops” in order to avoid arousing suspicion. The FSA added that the “total disregard for proper standards by these traders and brokers” is clear from documented communications in which they referred to each other in “congratulatory and exhortatory terms” such as “the three muscateers [sic]”, “superman” and “be a hero today”. Its final notice also revealed that UBS made “corrupt payments” of £15,000 per quarter to brokers to reward them for helping the Swiss bank manipulate interest rates. “The integrity of benchmarks such as Libor and Euribor are of fundamental importance to both UK and international financial markets. UBS traders and managers ignored this,” she added.